This is a good sequel with a cliffhanger ending setting up book 3. Wren’s world has changed. The thing that she fought for - escaping the dome - has come to fruition, but it’s not the paradise she thought it would be. Most of the shiners have died, and according to James she is to blame for many of the deaths, a burden which sits heavy on her shoulders. Still some have survived and Wren is determined to keep them safe as they fight to establish a home outside while hiding from the rovers who have weapons that can kill from far away. But as long as she has Pace she knows everything will be fine. Still Wren wonders, as she sees the smoke that continually pours forth from the dome, how did her friends inside fare? Will they ever find out if Lucy, David, Jill, and Harry, along with Pace’s mother survive the explosions? Meanwhile, someone else has also seen the smoke. A band of explorers from across the sea arrive in an airship, curious about the dome, and offer help to those who survive. When Wren meets the handsome Levi Addison, she suddenly questions her love for Pace as Levi offers to show her the world from his airship. Does she really love Pace? Or was it just the circumstances that made her think she did? Meanwhile, word arrives from inside via Pip, and Wren is forced to go back inside the dome, a thing that terrifies her more than anything else, to save her friends. Once she’s back inside will she be able to escape again? In this sequel to Twilight of Ashes, Wren, Pace, James, Adam and a few more shiner friends have survived the rushing waters that drove them out of the exploding tunnels. Some of the blind ponies and goats have also survived. But there are many more deaths and losses. The small group is now forced to survive, with little in the way of supplies, in an alien environment where even the sun they have rarely seen can harm them. Wren discovers that her friend, John, who was forced outside, has survived and established a place of shelter. He warns of the threat of barbarian rovers who raid and carry off females. Wren is filled with self doubt and guilt that is fueled by the bitter James. She questions if living in freedom, with starvation and fear, is better than living the life of drudgery, but safety, that they had before she dared to dream of the outside. 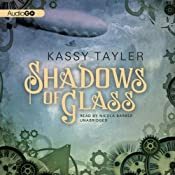 Suddenly Wren is faced with more strangers in an airship but she soon realizes that these foreign explorers are friendly. The remarkable family set out to help the small group of survivors to establish a safe community, offering even staff and weapons to protect against the rovers. The young man, Levi, is smitten by Wren’s simple beauty, her bravery, strength and determination. He doesn’t mean to come between Wren and Pace but if there is a chance for him to win her attention he intends to pursue it. Pip, Pace’s intrepid canary, brings a message to Wren from Lucy who is still inside the Dome. The call is “Help us!” Pace has to go back inside if he wants to rescue his mother while Wren feels she must find a way to help her friends inside. Levi’s Uncle agrees to use his ship to help get them inside where they soon are trapped into more danger. As this book closes, Wren, Pace and Levi face the angry leader of the Royals, Wren’s father. I liked the addition of the exploring US characters. It was interesting to try to imagine how the outside world, and strangers from far off, would effect Wren and her friends who have had little schooling. Presenting Levi as another romantic interest to catch Wren’s attention creates more conflict in addition to the struggle of surviving. Although it makes Wren appear shallow in her feelings I attribute some of her confusion to her youth and the stresses she has been experiencing. I felt there was too much repetition of Wren’s fearful doubts and thoughts for a good part of the first half of the book. Again this may be consistent with the angst of being a teen but it was a bit annoying. The story was entertaining and I was engaged and anticipating what would happen with the confrontation inside when book two abruptly ended. For those who really don’t like cliffhangers, be forewarned. I will be interested to learn the conclusion in volume three. Audio notes: Once again Ms. Barber does a good job giving emotional input to characters. She does a nice job with the accents and I enjoyed the listening. I received this title for review from AudioGo through AudioBook Jukebox. Great interview! This sounds like a very interesting story. I'm going to get the first one and give it a try. I liked this one too and the narration by Barber is awesome! I love her voice and how she does the different characters. I can't wait for Book 3.